What is this and why does it exist? So recently I have seen a lot of players complaining that there is nowhere they can go and look up and item, see if it is in store, see how much it costs, whether they can gift or trade it etc. I've seen a few website which offer bits of this, however some are out of date, some are slow and some just don't work all that well. In response to this I decided to put together this website which will allow users to look up items and retrieve basic information on them. 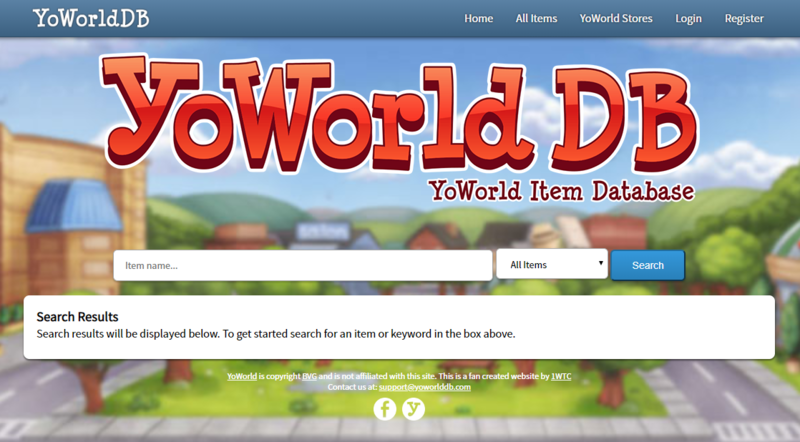 As well as this the site has a basic player search functionality, helping you to easily find other YoWorld players. The website is very simple to use. You just type in the name of the item you're looking for or a keyword related to the item and you will be presented with a list of results. A list of categories is also available to select from. 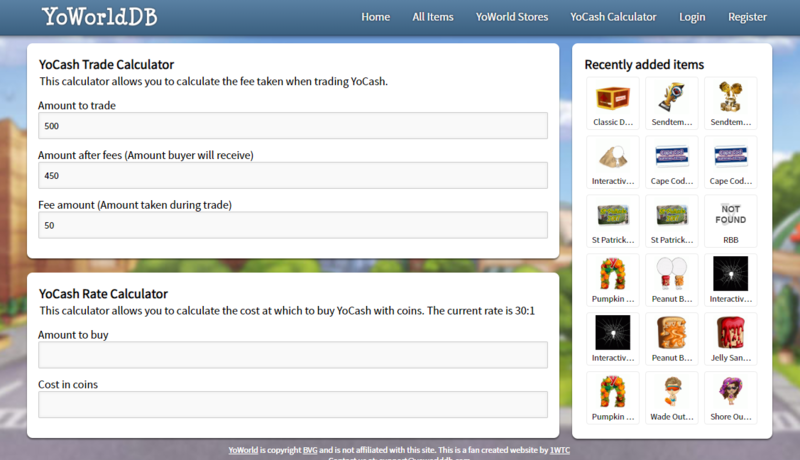 After searching you can then click on each of these items to view the price, availability, gift / trade status etc. Still can't find an item? 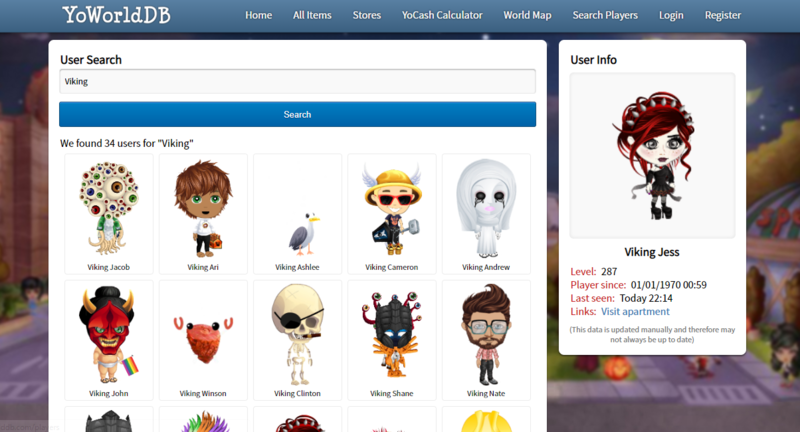 If you still can't find an item but you know what category it's in or you know roughly when it was released you can use the "All Items" page and search through all the items in the database, page by page. 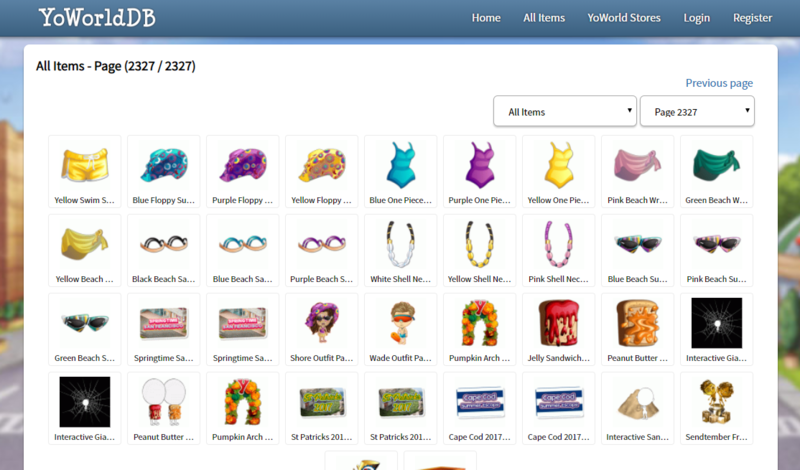 As with the search tool you can also narrow down the "All Items" page via categories as well. If after all that you still cannot find the item you're looking for and you think it might be missing from the database, please let me know in PM or via the this thread and I will do my best to manually add it. What about a price guide? 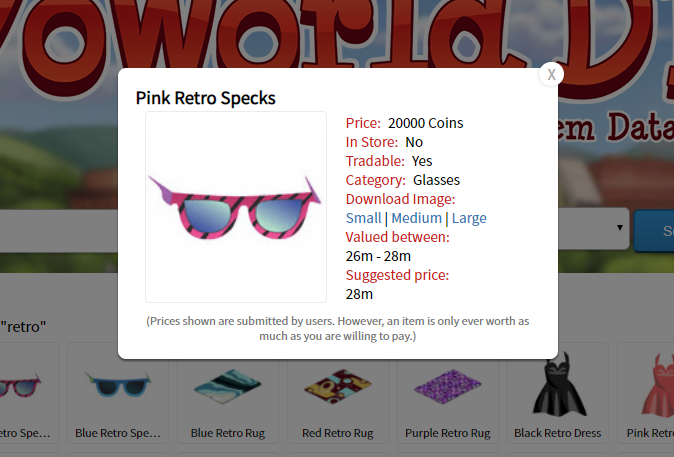 The website does contain a price guide feature, you can add prices to items via the "lists" feature by selecting "Price Guide" as the list type. From here you can input the price you believe the item is worth and the item's suggested price will change to reflect this. Systems are also in place to reduce price jacking. I believe that the price guide should be run by by the players / community instead of website admins. 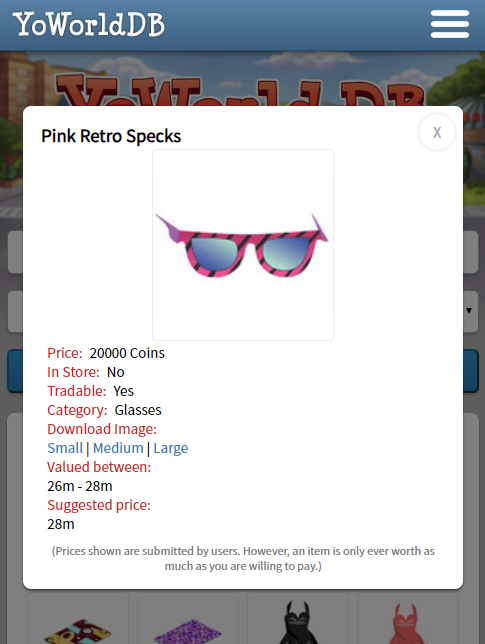 As seen previously with other price guides, prices can be adjusted by the website staff in order to increase the value of their own items. Which is wrong. Thank you to everyone who supports YoWorldDB, your support means a lot to me and I really appreciate all the feedback given. I am glad to see that people consider this website a valuable asset and I will always do what I can to make sure it meets everyone's needs. Last edited by 1WTC (131380246) on Fri Dec 14, 2018 6:14 am, edited 14 times in total. Wow, that's impressive....and useful. Nice job. Wow, love it! Reminds me a lot of dot com Thank you! Last edited by Maximino (187618720) on Sat Mar 17, 2018 1:14 pm, edited 1 time in total. Thank you so much for taking the time to do this! Very much appreciated ! What a kind thing to do. Thank you for your willingness and effort! I just spent an hour or so looking at stuff! little skeptical of the site. not "httpS"
Mr 0utrag3ous (103378167) wrote: little skeptical of the site. not "httpS"
Understandable, appreciate the effort, and will look forward to using the site once you're on secure.